To feed our math brains at 8 am on a Tuesday morning in the summer, we showed this photo of some watermelons in the hopes of generating some conversation. How many watermelons are there? How do you know? This was just going to be 10 to 15 minutes of a notice and wonder conversation. Yea. We were wrong. Fifty minutes later we were still chatting about watermelons. Who knew a pile of cut up watermelons could keep 45 educators engrossed. Really, what is there to talk about—it’s just a bunch of watermelons, people. So, here’s what we chatted about. 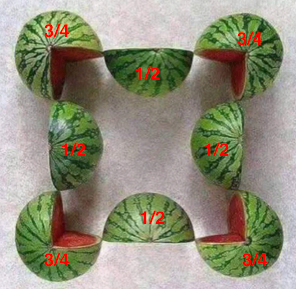 We predicted that the most common answer would be to cut up two of the one-half sized pieces to make the missing one-fourth pieces, slide those around to make 4 whole watermelons. Then, add the other two halves to make another whole watermelon. So, the sum of 4 whole watermelons and the other whole make 5 watermelons. We thought that some version of that idea would be a good start to the day. And then Shannon said, “I saw it another way. 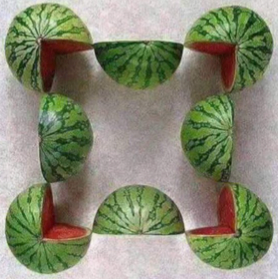 I saw 4 groups of 3/4 of a watermelon and then I added the 4 one-half sized pieces. So, 3 whole watermelons and two more means that there are 5 watermelons in the picture.” The conversation then moved to connecting Shannon’s use of the algorithm to the photo and then adding in the notation. This provoked lots of conversation on how come we can do this. How does the image show (4 x 3/4) = (3 x 4/4)? How does the picture show Shannon’s equation: (4 x 3/4) + (4 x 1/2) = 5? Here are some of our takeaways. We need to listen to what our kids are saying and not be on the lookout for the answer listed in the TE or for the student response that matches our preferred strategy. Your questions need to offer ALL kids a place in the conversation. So, in this situation we could have asked a couple of questions. How many watermelons are there? How many whole watermelons are there? 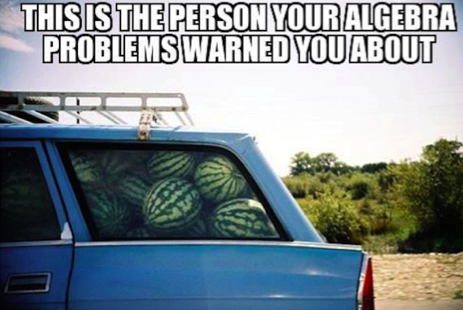 Which question lets the kid who says there are 8 watermelons be in the conversation? Math is an active subject—it’s interesting, irritating, perplexing, confusing and invigorating. It makes your head hurt when you are in the midst of the struggle and then you get to embrace the high fives when that last piece falls into place and the connection appears as a result of your hard work.